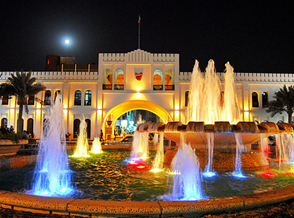 Adhari Park is an amusement park and a major tourist attraction in the Kingdom of Bahrain. It is themd after the historic freshwater spring known as Ain Adari located around the Zinjarea. With a coverage of 165,000 square meters, it has eight outdoor and indoor rides for people of all ages, a Family Entertainment Centre, a Food Court with 10 food outlets, a Dine-in restaurant, Coffee Shops and a whole lot more. 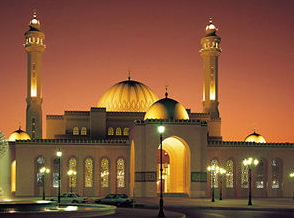 One of the largest mosques in the world, the Al-Fateh Mosque spans 6,500 square meters. It has the capacity to accommodate over 7,000 worshippers at one time. 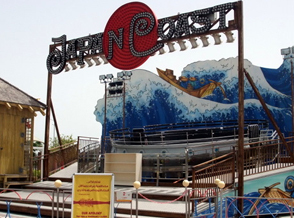 Built in 1987 by the late Sheikh Isa ibn Salman Al Khalifa, it was named after Ahmed Al Fateh, the conqueror of Bahrain. 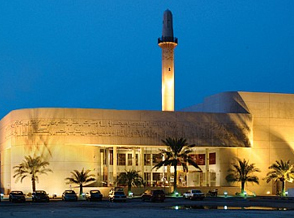 Al-Fateh is home to the National Library of Bahrain since 2006. 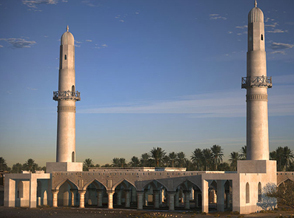 The Khamis Mosque is considered to be one of the oldest mosques in the region and believed to be the first mosque in Bahrain. Its foundation is believed to have been laid as early as 692 AD but an inscription found on the site suggests a foundation date of sometime during the 11th century. The mosque has been rebuilt twice in the 14th and 15th centuries, when the minarets were constructed and has been partially restored recently. 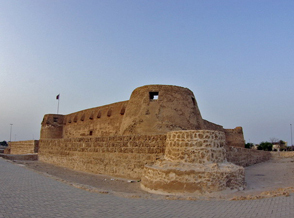 Arad Fort, a 15th-century fort in Arad, Bahrain, is one of the compact defensive forts in the kingdom. It was built in the typical style of Islamic forts during the 15th century A.D. before the Portuguese invasion of Bahrain in 1622 A.D. It overlooks various sea passages of Muharraq's shallow seashores in its present location. The fort which has been extensively renovated and is illuminated at night, enjoys close proximity to the Bahrain International Airport. A historical building located in the Customs Square in Manama's former central business district, Bab Al Bahrain marks the main entrance to the Manama Souq. Completed in 1945, Bab Al Bahrain once stood close to the water's edge. Due to the extensive land reclamation in the later years, the sea is now located a few kilometres north. Bab Al Bahrain was designed by Sir Charles Belgrave, adviser to the Emir. 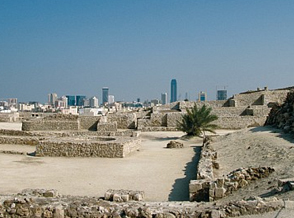 The Qal'at al-Bahrain is an archaeological site located in Bahrain, on the Arabian Peninsula. It was once the capital of the Dilmun civilization and was inscribed as a UNESCO World Heritage Site in 2005. Archaeological excavations carried out here since 1954 have unearthed antiquities from an artificial mound of 12 m (39 ft) height containing seven stratified layers, created by various occupants from 2300 BC up to the 18th century, including Kassites, Portuguese andPersians. 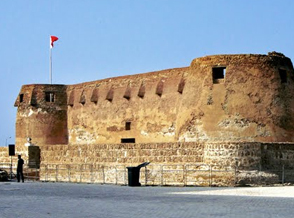 It is also known as the Bahrain Fort or Fort of Bahrain and previously as the Portugal Fort. 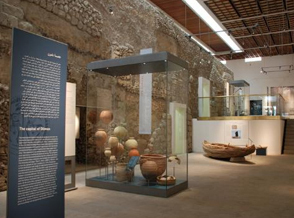 The Bahrain National Museum also referred to as National Museum of Bahrain is the largest and one of the oldest public museums in Bahrain. Constructed near the King Faisal Highway in Manama and stands next to the National Theatre of Bahrain, this US$30 million museum complex covers 27,800 sq meters and consists of two buildings. It opened in December 1988. The Barbar Temple, considered to be a part of the Dilmun culture, is an archaeological site located in the village of Barbar, Bahrain. Two more temples were discovered at the site with the oldest dating back to 3000 BC. The most recent of the three Barbar temples was rediscovered by a Danish archaeological team in 1954. The temples were built of limestone blocks and believed to have been carved out from Jidda Island. Beit Al Qur'an which directly translates to “House of Quoran” is a multi-purpose complex dedicated to the Islamic arts. Established in 1990, the complex is most famous for its Islamic museum, which has been acknowledged as one of the most renowned Islamic museums in the world. It is located in Hoora, Bahrain. 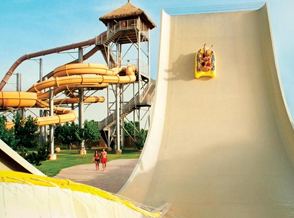 The "Lost Paradise of Dilmun" Water Park covers an overall area of around 77,000 square meters, with a built-up area of 45,000 square meters and around 20,000 square meters for future expansion and car parking. Its theme is based on Bahrain’s rich history and the civilization of Dilmun. At any given time, up to 5,000 visitors enjoys its state-of-the-art facilities. It was developed by the Al Areen Holding Company with an investment of US$ 50 million. 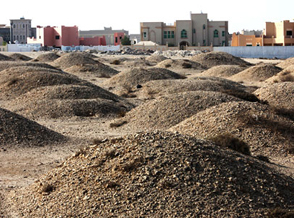 The Dilmun Burial Mounds are a number of necropolis areas on the main island of Bahrain. Dating back to the Dilmun, the Umm an-Nar Culture and later eras, it was known as an island with a very large number of burials since ancient times. The number of square kilometres of mounds were said to be one of the largest cemeteries in the ancient world. The cemeteries are concentrated in the north of the island, on the hard stony areas slightly above the arable farming soils. Bahrain was the first place on the Arabian side of the Persian Gulf where oil was discovered. 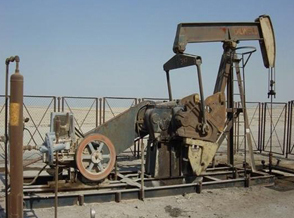 Hence, as its name suggests, the First Oil Well is located in Bahrain. Oil first spurted from this well on 16 October 1931, and the well finally began to blow heads of oil on the morning of 2 June 1932. Situated below Jebel Dukhan, it was operated by Bahrain Petroleum Company. 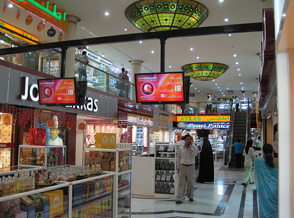 Be transported to a modern gold souq arena at the Gold City which is a radiating example of specialized retail shopping. Choose from exclusive showrooms dedicated to precious metals and assorted gems here. With a contemporary decor, a welcoming staff and free valet services, the Gold City is at the top of its class. Bait Al-Jasra is a traditional-style house made of coral stones and palm tree trunks built in 1907 by Shaikh Hamad bin Abdullah Al-Khalifa. It was later adopted as a summer home for Shaikh Salman bin Hamad Al Khalifa. Famous for being the birthplace of Isa bin Salman Al Khalifa, the Emir of Bahrain until 1999, in 1933, the house was dilapidated and was restored in 1986. 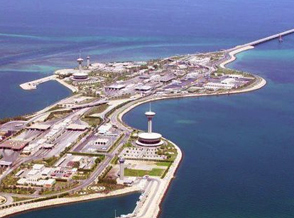 A series of bridges and causeways connecting Saudi Arabia and Bahrain, the King Fahd Causeway was built based on improving the links and bonds between Saudi Arabia and Bahrain. Surveying of the maritime began in 1968. Construction began in 1981 and continued until 1986, when it was officially opened to the public. 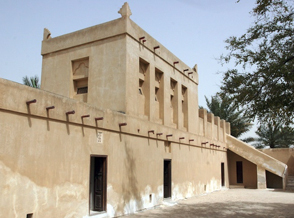 Riffa Fort or Qal'at ar-Rifa' and now named Shaikh Salman bin Ahmed Fort was built as a fort during the reign of Shaikh Salman bin Ahmed Al Khalifa in 1812. It was converted into a residence in the 19th century for Shaikh Salman Bin Ahmed (Al Fateh) Al Khalifa. The fort offers a splendid view across the Hunanaiya valley. 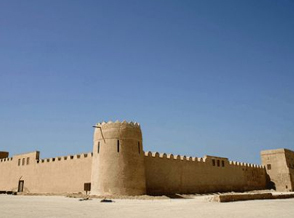 This fort was strategically important until 1869 when Riffa was home to the seat of government. A multi-attraction destination, the Riffa Golf Club, now known as The Royal Golf Club, Riffa Views is an international level, Montgomerie designed 18 hole golf course and a premium dining destination with options ranging from its famous Bacon Butties available in Cafe T through its signature Steak Stone dish and its popular Friday Carvery. Its golf shop carries the widest range of golf products in Bahrain. 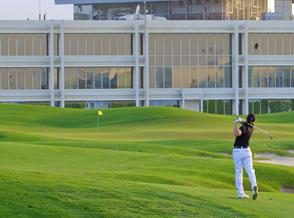 Its Royal Golf Academy has been meticulously designed to provide unrivalled tuition experiences for all. 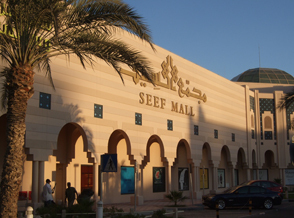 Located in the Seef district of the capital city, Manama, Seef Mall is the second largest mall in the Kingdom of Bahrain. It is directly connected to Fraser Suites at the western end of the mall. Meanwhile, near the eastern end at the entrance near the Marks and Spencer store is the Al Aali Shopping Complex. To its south is the Shaikh Khalifa Bin Salman Highway. Beyond the highway to the south is The Bahrain Mall. To its southeast is the Bahrain International Exhibition & Convention Centre. The home of Shaikh Isa bin Ali Al Khalifa, the King’s great-great-grandfather, sovereign from 1869 to 1932, the longest reign of a Bahrain ruler, in Muharraq provides a glimpse of royal life in the 19th century. Its period architecture and wall carvings are astonishing in nature. It’s also considered as one of the best places to feel the amazing effects of the wind tower. 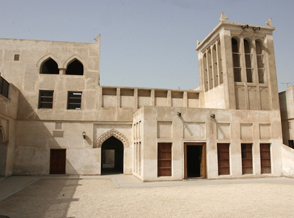 The Siyadi House, also known as Bayt Siyadi, is a historic building in Muharraq City, Kingdom of Bahrain. 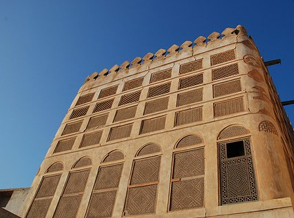 It is part of a larger complex of buildings constructed for the pearl merchant Abdullah bin Isa Siyadi. This structure further includes a mosque and a majlis. The construction of the Siyadi Majlis was initiated by Ahmad bin Jassim Siyadi, while the Siyadi Mosque was a shared initiative of Isa and Jassim bin Ahmad Siyadi. It is part of the Bahrain pearling trail, a UNESCO World Heritage Site. 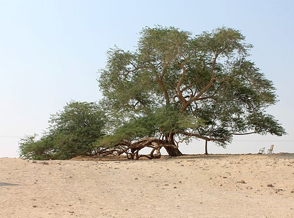 The Tree of Life is an approximately 400 year-old, 9.75 m (32 ft) high Prosopis cineraria tree located 2 km (1.2 mi) from Jebel Dukhan in Bahrain. The tree is a local tourist attraction, as it is the only major tree growing in the area. Standing on top of a 7.6 m (25 ft) high sandy tell that formed around a 500-year-old fortress, the tree is visited by approximately 50,000 tourists every year.